Apple users can now update their iOS 7 into much latest version that fixes a bug that allows iPhone, iPad and other Apple devices users to bypass the lock screen. Apple iOS 7.0.2 is now available for download. All you have to do is locate the icon SETTINGS then press the GENERAL button and click the Software Update. The tech site The Next Web reported that, "The vulnerability was a small, but significant one; a video detailing the process shows that the workaround could be used to access the camera interface, all of the user’s photos and then share them to various social networks or via email. The security flaw reportedly couldn’t be used to access any other part of the device." According to Graham Cluley, security researcher said that the latest iOS fix is also for the passcode flaws that had "embarrassed" Apple since they released the iOS 7 version. 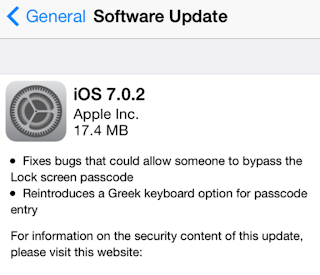 The new iOS 7.0.2 also introduce the Greek Keyboard option for passcode entry. For the meantime, please bookmark this page now or visit this site more often for you to be updated. You may also share this post to your friends so they may know about Apple iOS version 7.0.2 is now available for download. Comments or suggestions about "Apple iOS 7.0.2 is now Available - Fixed the Lock screen bug" is important to us, you may share it by using the comment box below.